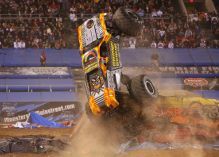 Monster Jam Returns to Pittsburgh in February! Plus enter to win 4 free tickets! 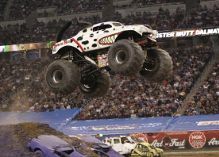 February 14-16, 2014 Advance Auto Parts Monster Jam returns to Pittsburgh, starring the biggest performers on four wheels: Monster Jam monster trucks! The twelve-feet-tall, ten-thousand-pound machines will bring you to your feet, racing and ripping up a custom-designed track full of obstacles to soar over or smash through! Monster Jam provides a massive night’s entertainment tailored perfectly for your family’s budget, and these colorful, larger-than-life beasts are sure to capture the hearts of both young and old. 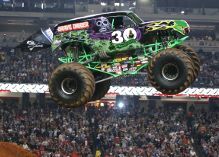 Trucks: Grave Digger, Maximum Destruction driven by Tom Meents, Advance Auto Parts Grinder, El Toro Loco, Brutus, Spike, Crushstation and Spiderman. Register to WIN (4) Tickets for Friday February 14 – 7:30pm show! Must be 18 to enter. 1 entry per day allowed. Random winner will be chosen at 5pm on Friday, January 24 and notified by email. Click here to enter to win 4 tickets! This entry was posted in Deals & Money Makers, Giveaways. Bookmark the permalink.